Walk in the footsteps of the Apostle Paul, as told in the New Testament, on an amazing journey throughout Greece. Discover spectacular views of the capital from one of the world’s most famous archaeological sites, enjoy traditional Greek cuisine, & more. Mars Hill – Site where the Apostle Paul gave his famous sermon, found in the book of Acts. Meteora Monasteries – Monastery complex built on top of steep pinnacles. Ancient Philippi – See the remains of the jail where Paul & Silas were imprisoned. Arrive at the airport in Athens, & transfer to the hotel. Enjoy the remainder of the day at leisure. Stand on top of Mars Hill, where the Apostle Paul gave his famous sermon, found in the book of Acts. Enjoy scenic views of the city from the Acropolis, & see the famous Greek temple, the Parthenon, which served as a Christian church during the 6th century A.D. Take a stroll through Syntagma Square, & see the Tomb of the Unknown Soldier, where the Changing of the Guard takes place. Other sightseeing highlights include the Parliament House, the National Library, & The Academy. Follow in the steps of the Apostle Paul this morning, as you make the journey to the ancient city of Corinth. Enjoy a brief visit to the Corinth Canal along the way. Upon arrival, explore the remains of the city where Paul conducted missionary work with the disciples Aquila & Priscilla. See the Bema, where Paul stood trial, the first century shops, the Temple of Apollo, & the Agora. Return to Athens for an overnight stay. In the morning, head for Kalambaka, a city graced with scenic views of some of the world’s most unique monasteries. These sacred buildings, built on top of steep pinnacles, feature inspiring frescoes, some of which date back to the 14th century. After visiting the Meteora Monasteries, enjoy dinner & an overnight stay in Kalambaka. Travel to Veria to admire the Apostle Paul’s memorial, The Bema, constructed in honor of his missionary work in the ancient Jewish community. Explore the Jewish Quarter before heading to Thessaloniki for dinner & an overnight stay. 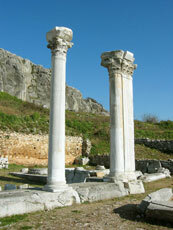 Head for the archaeological site of ancient Philippi today. See the Forum, the Christian basilicas, the theater, & the jail where Paul & Silas were imprisoned. Afterward, travel to Kavala for dinner & an overnight stay. Discover charming Thessaloniki. See the remains of the city walls, which date back to the 4th century B.C. Take a walk through the Church of St. Demetrius, which features famous Byzantine mosaic artwork. Other sightseeing highlights in the city include the 4th-century A.D. Rotunda & Arch of Galerius & the White Tower of Thessaloniki. Return to Athens for dinner & an overnight stay.